Cebu Medical Supply, Inc. is a distributor, wholesaler and importer of medical, hospital, laboratory, dental equipment and supplies. The company has been in the medical equipment business since 1954 and as such, is considered one of the most reputable companies in the country. 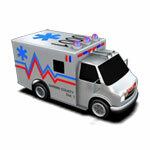 New products include new & used Mini-Mod, Type II & Type III ambulances. Exhibitor at the 2008 Philippine Hospital Association Convention at the historic Manila Hotel. Copyright of Cebu Medical Supply Inc. All rights reserved.